“I wanted to give a little followup. Last year I purchased both an R2 and Lt saddle to try on my touring bike. I ended up using the R2 first and it’s been fantastic… went over the Rocky Mountains on it. Following your advice I mounted the Lt on my Warbird and fitted it “nose horizontal” to the ground and the difference is drastic. I only pedaled it around the street briefly without cycling shorts but I can feel a difference here that I was truly hoping for. I also took the opportunity to tweak the R2 on my touring bike. I had it set up wrong, as I leveled it from front to back and not JUST the nose. Oops. So now it’s properly leveled. It’s a lot more comfortable now, and it’ll be fun to ride it over the summer on my weekender tours. “I just got the saddle and took it on a 20 km test ride. It is an instant fit! 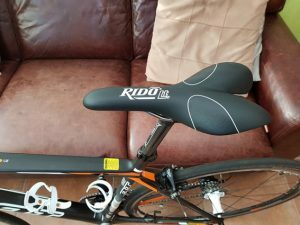 I recently was looking for a new saddle for my race bike since I was suffering from pain and numbness with my previous saddle (despite it being a comfort model). I researched the topic and came about your saddles. What I read convinced me to give it a try. So I reached out to a dealer in Switzerland (Onncycle) that seemed to offer the range and ordered an Rido Lt in white. The dealer then said he was no longer importing them due to some custom hassles. But he offered to sell me a silver Test saddle with orange writing (brand new in box) for a reduced price, the only saddle he had left. I just got the saddle and took it on a 20 km test ride. It is an instant fit! What a relief, no numbness finally! It also felt really good instantly and confirms all the claims you make. But now, I really want the saddle in white to match colors on my bike and I would then have the silver test saddle sitting around gathering dust. So, I wanted to ask you if I could send the test saddle back to you (in spotless condition), so you can make some use of it lending it to prospects and in turn order a white RLt. with a rebate instead? If that is feasible, I might even order a 2nd saddle but I need to know which model you would recommend for a MTB? Would it also be the LT. or the R2? On the MTB I do mainly gravel roads and forest trails, pretty laid back riding. I am looking forward to hear back from you soon! 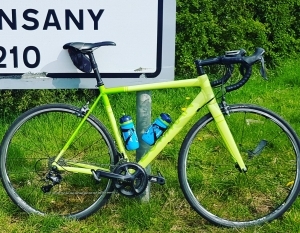 “Hi, Just a quick email to say that I’ve been riding mainly indoors this winter using Zwift and a couple of months ago I had a raised PSA test. I’ve had all the tests and go back in August and have been told not to ride my bike for 2 weeks before the blood test as my results may be affected. I posted on social media and had positive responses from all over the world and as a result bought a Rido 2 for the turbo bike, Cannondale 6 Carbon. I’ve got on with the saddle but wanted a sportier look so I bought a R-Lt which I fitted this morning. Without any changes to the settings I tested the saddle on the Zwift Central Park loop course and knocked 8 minutes off my best time. As nothing else has changed it can only be the saddle. I’m going for a bike fit tomorrow which is why the saddle change so it will be interesting to see what effect that has.